Xamarin is a Cross platform framework for mobile development and lets you build iOS, Android and Windows Phone applications using C#. Applications can share up to 90% of their code since, Xamarin Mobile library offers a unified API to access common resources across all three platforms and by using Xamarin.forms the UI code can also be made common. This can reduce development cost as well as time. In this blog post, we’ll connect Dynamic CRM with Xamarin Form application using ADAL authentication and CRM mobile helper library. Once done, we shall execute the WhoAmIRequest. 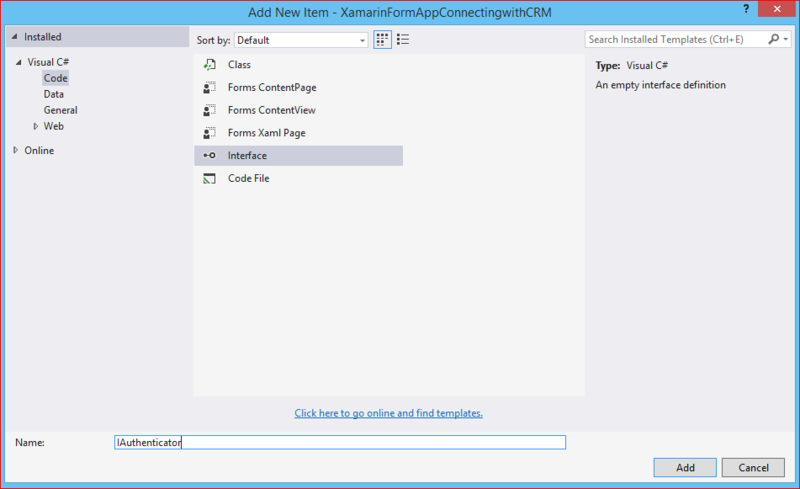 Create a Xamarin.Forms app in Xamarin Studio or Visual Studio. 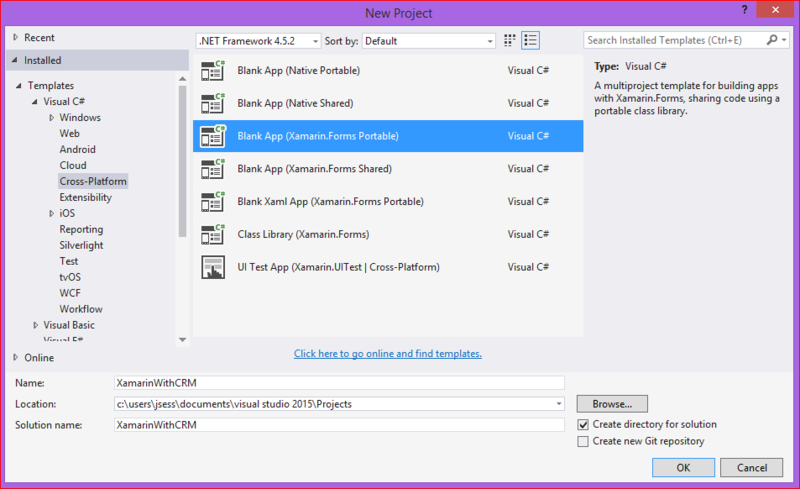 To do so create new project and select Blank App (Xamarin.Forms Portable). Give a proper name and click OK. It will create six projects: PCL (Portable Class Library), Android, iOS, and Windows Phone. Add ADAL library version 3.5.207081303-alpha to each project. Get it from this link. Add Microsoft.Crm.Sdk.Mobile sample. It is a partial re-implementation of the Microsoft Dynamics CRM SDK classes written as a Portable Class Library to facilitate development in phones. Get it from Link. To add this library into your project, Right click the portable project and click Add | New Folder. Name it as MobileHelper. 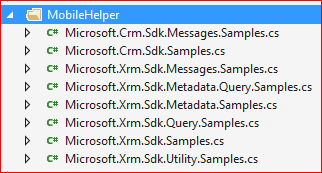 Double click Microsoft.Xrm.Sdk.Samples.cs to open the cs file. Comment out line 35, and 666-682. 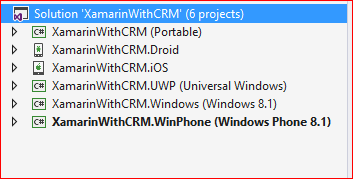 There lines are for Windows Store/Phone application and Xamarin does not understand it, and Build the solution. Whenever we use platform specific functions in Xamarin form we use DependencyService. It is used to call specific functions from shared code (Portable Project). The first component is to create Interface. The interface is used to interact with platform-specific functionality. The required functionality is defined by an interface in shared code. Add a new interface to your PCL Project with the Authenticate method. To add a new interface right click the PCL project then click “Add” and then click “New Item”. Select Interface from the list, give name “IAuthenticator”. Add the Authenticate function to your interface. 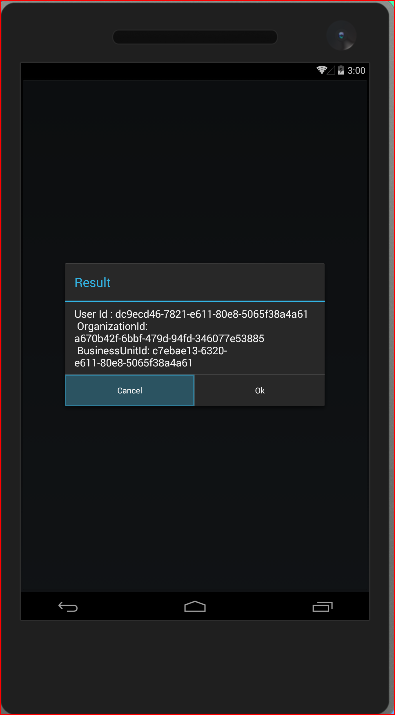 Add a new class to your android project and name it “Authenticator”. Add the following function to the “Authenticator” class, which is the implementation of the “Authentication method” in Android as given below. We also need to override the OnActivityResult method in the MainActivity.cs in Android project. The purpose of this method is to continue the authentication flow. Add a new class to your IOS project and name it “Authenticator”. Add the following function to the “Authenticator” class, which is the implementation of the “Authentication method” in IOS as shown below. No need to implement function to continue the authentication flow in IOS. Add a new class to your Window Phone project and name it “Authenticator”. 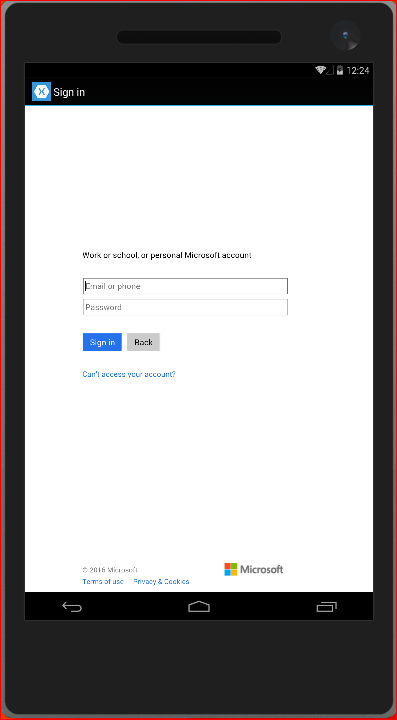 Add the following function to the “Authenticator” which is the implementation of the “Authentication method” in Windows phone as shown below. Windows Phone also need to implement function to continue authentication, add the following method to the App.xaml.cs file. Each platform implementation of the Interface “IAuthenticator” need to be registered with the DependencyService. All you need to do is add the assembly reference above your class definition and outside of any namespace definition that may be contained within that file as well. Add a new class named Constants which will contain the information’s for accessing token as shown below. Add a new Xaml Page to your Portable project, and name it “MyPage”. Add the following line and comment all other code in the constructor of the App.cs file. This will call “MyPage” when we execute our App. Add a Button to the MyPage. 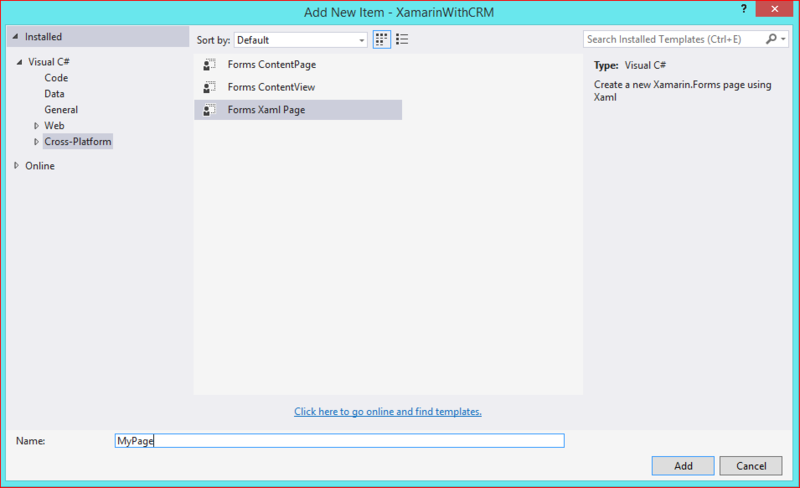 Now we have to add the Clicked method to the MyPage.xaml.cs file. In this method we will use the Get function of the DependencyService for authentication. And we will call another function from it which will execute the WhoAmIRequest. MyPage.xaml.cs file should look like shown below. In the Clicked method the DependencyService.Get<T> function will find the correct implementation of interface T, and will call the Authenticate method of that Implementation. Now, we can use the Dependency Service from Xamarin.Forms to locate the Authenticate method in each platform and execute it. The first screen should look like shown below. Click the button ”Sign in to CRM”, and you will have the following screen in which the ADAL function “AcquireTokenAsync” used in the Authenticator function will ask you for your CRM Credentials. Add you CRM credentials and Click Sign in. In the following screenshot you can see the AccessToken. In the next blog post we will retrieve the data from Dynamics CRM and show it in the list view. The ADAL version you referenced is no longer available. Is there a different version available that I should use? Also, have you considered hosting this project on GitHub? Hey so…you got a github of this? Your code has a lot of html tags in it for being C#. How is the performance of the API web calls with a Xamarin app? Is it slow? Can you use Redis cache to speed it up? 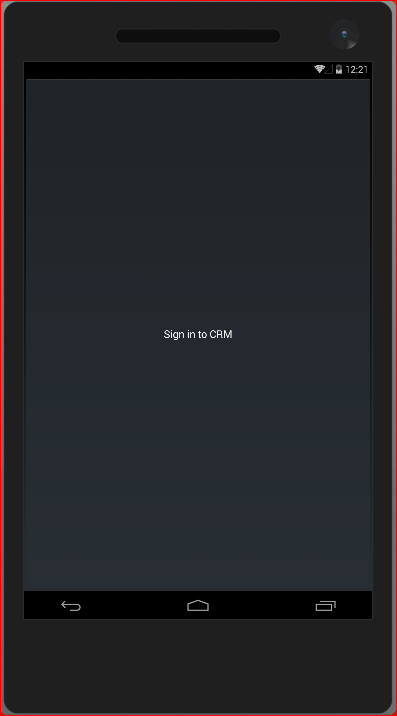 granted crm permission via app manifest, and… voilá! Hey can you explain how do i get clientid for authentication? Is there any task need to be done in Microsoft Azure?